CURTIS, Wash. – Alfred Hamilton, whose billboard emblazoned with conservative messages engaged drivers on Interstate 5 for decades, has died. Hamilton, 84, suffered from Parkinson’s disease and cancer. He died Tuesday at his home in this southwestern Washington town. 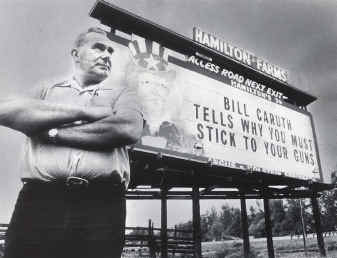 His two-sided “Uncle Sam” billboard dates back to 1971. Over the years, it has carried a litany of messages aimed at politicians Hamilton didn’t like as well as homosexuals, Russia, abortion, communism, big government, the United Nations and gun control, to name a few. The family has not yet decided what to do with the billboard, she said. Born March 31, 1920, Hamilton was raised in nearby Chehalis, attended a one-room school and later studied at what is now Washington State University. He left without graduating during World War II. Hamilton married Ruth Knoles in 1942, and the couple had five children. He raised sheep for a time and then switched to turkeys, developing a breed with veterinarian George Duby that was a hit with restaurants in the region. But he was best known for his billboards. In 1971, then-state Attorney General Slade Gorton sued Hamilton under the Scenic Vista Act. The case was resolved eight years later in Hamilton’s favor. In 1983, Hamilton and his wife set out on a round-the-world sailboat cruise that took nine years. Tom Bradshaw, pastor of Chehalis First Christian Church, met him after his return. Hamilton’s wife died in 2001. He is survived by his sister, Betty; his children; and 12 grandchildren.